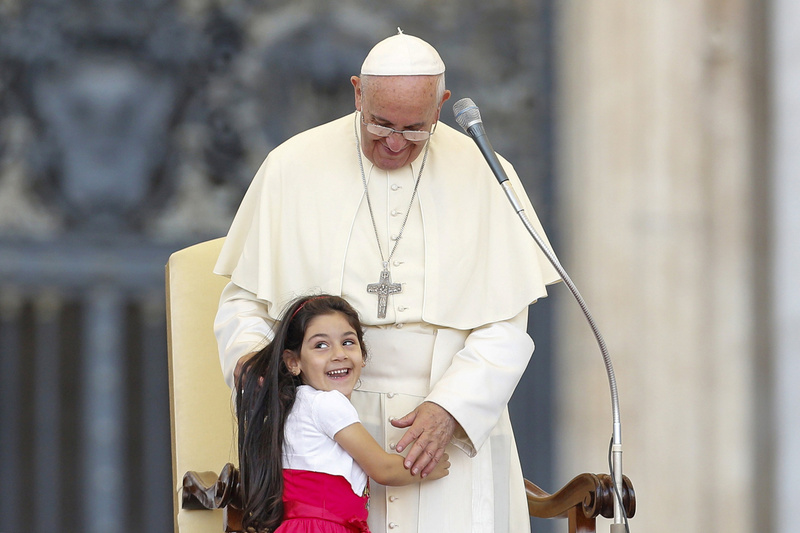 In Pope Francis’ pastoral theology, people come first. “The wellbeing of the people is the highest law,” is a maxim of ancient Roman Law that still holds a place of honor in the Code of Canon Law. Salus populi suprema lex, it reads in Latin. It is often one bit of canon law most Jesuits recall long after they have completed their seminary training. It is more than a nostrum for hard cases. It is a distillation of the wisdom of the legal tradition at its best. For Pope Francis salus populi is the superscript over his pastoral theology: people, first; the spiritual welfare of people above all. Francis quotes the maxim in “Amoris Laetitia,” his apostolic exhortation on the family. In context, salus populi is Francis’ refutation of canonists and moral theologians who put rules ahead of people in a mistaken view of pastoral care. The Holy Father also warns against treating moral duties too lightly. But his basic message is still that the Gospel is a message of mercy. The church is a community of those who continue to be recipients of God’s mercy. It is also a community of apostles of mercy, who show to one another the mercy God has shown to them. In this year of mercy, Pope Francis writes, the church “seeks to encourage everyone to be a sign of mercy and closeness wherever family life remains imperfect or lacks peace and joy” (No. 5). The church’s mission, he contends, is “to offer understanding, comfort and acceptance, rather than imposing straightaway a set of rules that only lead people to feel judged and abandoned by the very Mother called to show them God’s mercy” (No. 49). Francis appeals repeatedly to Jesus’ encounters with two women in John’s Gospel as models of pastoral care: the Samaritan woman and the woman caught in adultery. Of Jesus’ care for the women, he writes, “set forth a demanding ideal yet never failed to show compassion and closeness to the frailty of individuals” (No. 38). The moralizers who want to impose hard rules on others fail to appreciate that as a result of Jesus’ kindliness, patience and discretion, “the consciousness of sin [was] awakened by [the women’s] encounter with Jesus’ gratuitous love” (No. 64). Jesus, Pope Francis points out, appealed to the yearning in the women’s hearts to lead them to conversion and faith. Of the Samaritan woman, he writes, “he addressed her desire for true love, in order to free her from the darkness in her life and to bring her to the full joy of the Gospel” (No. 294). Of the woman caught in adultery, he observes that “alone with Jesus, she meets not condemnation but the admonition to lead a more worthy life” (No. 27). In his attention to the desire for moral and spiritual growth, Francis follows the Jesuit founder, St. Ignatius, who urged the early Jesuits to always seek “the progress of souls,” frequently defined as love of God, charity to the neighbor and the growth in other virtues. Pope Francis’ special turn on this approach to pastoral care is, with strong support from Thomas Aquinas, to insist on the blend of failure and aspiration in most human lives. In traditional moral and spiritual theology, there was a conviction that one had to turn one’s back to a life of sin and only then to make progress in the Christian life. Even St. Ignatius made this assumption, presenting in the Spiritual Exercises two sets of rules, one for those “going from mortal sin to mortal sin” and another for those advancing in the Christian life. Following this divine pedagogy, the Church turns with love to those who participate in her life in an imperfect manner: she seeks the grace of conversion for them; she encourages them to do good, to take loving care of each other and to serve the community in which they live and work (No. 78). Appealing to Aquinas, the Second Vatican Council, the synods of 2014 and 2015 and standard moral theology to substantiate his arguments, Pope Francis believes men and women can fall short of the moral “ideals,” that is, what he seems to prefer to call them, and still bear within them seeds of a Gospel life. These seeds may be found in natural marriage, in the marital practices of other religious traditions and cultures and in imperfect marital situations. Francis has taken to heart the saying of Jesus, “It is not those who are well who need the physician, but those who are sick” (Lk 5:31). He obviously hopes that others who minister in the church—bishops, priests, moral theologians, confessors and pastoral counselors—will follow Jesus’ example. Francis cites the 2014 synod, saying, “the Church must accompany with attention and care the weakest of her children, who show signs of a wounded and troubled love, by restoring in them hope and confidence” (No. 291). Because most couples receive pastoral care in parishes, the pope writes, pastoral workers “require a more adequate formation.” The preparatory reports for the synod indicated “that ordained clergy frequently lacked “the training needed to deal with the complex problems currently facing families” (No. 202). In light of the real messiness of our moral and religious lives, and the presence in less than perfect lives of elements of goodness and grace, Pope Francis appeals to “the law of gradualness,” a principle first articulated by St. John Paul II. In his own apostolic exhortation on the family, “Familiaris Consortio,” the late pope argued that a person “‘knows, loves and accomplishes the good’ in stages…in the prudential exercise of free acts” (No. 295). This principle acknowledges that men and women “are not in a position to understand, appreciate, or fully carry out the objective demands of the law” at a single moment, but over time. Though he does not cite the now voluminous literature on moral and religious development from authors like Erik Erikson, Don Browning, Carol Gilligan and James Fowler, as a pastor, Pope Francis understands people attain maturity only gradually and their integration of any stage of moral development is subject to reformation in times of crisis, and so needs to be reaffirmed over and over again in the course of our lives. This pastoral insight moves Catholic moral theology from an intellectualist and act-oriented view of the moral life to a richer developmentalist one of the whole person as a moral actor. Pope Francis’ pastoral realism, moreover, by recognizing the complications of anyone’s full religious-moral life at any given point in time likewise grounds an existential Christian ethics in which the conditionedness and fragmentariness of our moral attainments and our constant need for moral growth come into focus. Morally—and religiously—we are works in progress. The results for pastoral practice are wider than just the accompaniment of men and women in “irregular situations” like cohabitation, civil marriage, second marriages without annulment and so on, which Francis treats late in the document. It opens up new perspectives for all of us. We are brought into what was once and is again the domain of spiritual guidance rather than auricular confession narrowly understood. There the concern is “the movements of the soul” for good and ill. It is a field in which Francis is a master who is able at one stroke to identify a person’s strengths of character and that person’s dominant vices. The pope’s pastoral theology anticipates a time when confession will once again be associated with spiritual direction, and confessors are “soul friends,” or Anam Cara, as Celtic Christianity called those who accompany the faithful through the passages of the Christian life. That is a shift that will demand major changes in the theological and spiritual formation of diocesan clergy. In fact, pastoral accompaniment is a major, even a dominant theme of “Amoris Laetitia.” He cites the synod on how Jesus “looked upon the women and men whom he met with love and tenderness, accompanying their steps in truth, patience and mercy as he proclaimed the demands of the Kingdom of God’” (No. 60). He treats at length the accompaniment pastors should offer engaged couples preparing for marriage, those in the early year of marriage and bereaved spouses. That accompaniment, moreover, is a responsibility that falls on the whole church, “on parishes, movements, schools and other Church institutions” as well (No. 229). The theme of accompaniment finds a special place in pastoral care of “the weakest,” those who are divorced and remarried, the cohabiting, those in troubled marriages. He rightly insists that those in irregular situations are members of the church who we all, and especially the church’s ministers, must care for. “They are not excommunicated” (No. 243). It is especially in pastoral care of those in less than perfect marital situations that Francis fully reveals his spiritual friendship model of pastoral care. For it is there in teaching the faithful to make conscientious judgments, bringing together their aspiration for God with the specific, complicated and troubled circumstances of their lives, that pastors assist couples in discerning where God is calling them at this point in their lives. “Discernment must help to find possible ways of responding to God and growing in the midst of limits,” he writes. By thinking that everything is black and white, we sometimes close off the way of grace and of growth, and discourage paths of sanctification which give glory to God. Let us remember that ‘a small step, in the midst of great human limitations, can be more pleasing to God than a life which appears outwardly in order, but moves through the day without confronting great difficulties.’ The practical pastoral care of ministers and of communities must not fail to embrace this reality.